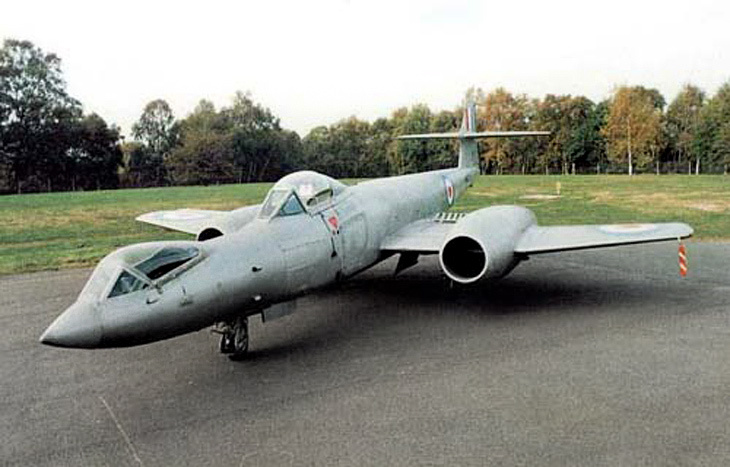 Strange Vehicles > Gloster Meteor F8 "Prone Pilot"
The Gloster Meteor F8 "Prone Pilot" was a bizarre proof-of-concept aircraft designed to explore the benefits, and drawbacks, of having a pilot in the prone position. The project was overseen by the RAF Institute of Aviation Medicine. By the 1950s, aviation experts already knew that pilots in the prone position could handle higher g-forces than if they were sat upright. And with combat aircraft rapidly becoming faster and faster, and the pilots having to cope with the ever higher g-force effects, the military was keen to try and find a solution. 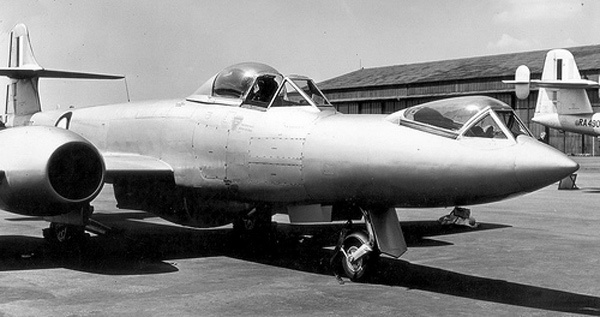 The Gloster Meteor F8 "Prone Pilot" started life as an ordinary Gloster Meteor. It was the very last Meteor to be produced (Serial No. WK935) and it was immediatley modified by the manufacturers Armstrong-Whitworth as an in-house project. The standard cockpit was retained, and had fully functioning controls. However, up front a longer nose section was added and an extra canopy installed for the prone pilot. The forward cockpit had an unusual control layout - necessitated by the horizontal position of the pilot. The control column was offset to the right and the rudder pedals were reconfigured to suit the unconventional layout. 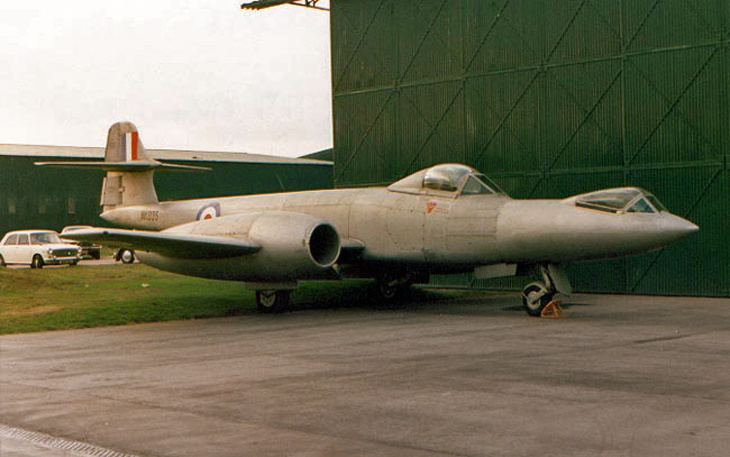 The Gloster Meteor F8 "Prone Pilot" first flew on February 10 1954. For obvious safety reasons it always had two pilots aboard, and was never flown with just the forward cockpit occupied. Perhaps the most worrying aspect of the design was the prone pilot�s means of escape should he need to bail out. 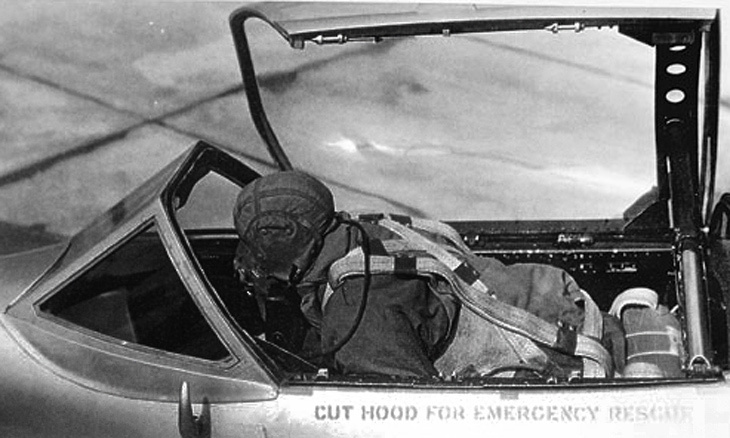 First he had to jettison the rudder pedals, then he had to crawl backwards to an escape hatch, retract the nose wheel and jump out. The meanwhile the other pilot had a Martin-Baker ejection seat. Armstrong-Whitworth's lead test pilot, Eric George Franklin carried out all the tests flights in the prone position. Over the course of a year the aircraft made 99 flights and accumulated 55 hours of flight time. And one way or another it was a success. It�s mission was to see if their were any benefits to the prone pilot position. It proved, conclusively, the opposite. Aside from being more difficult to fly due to the unconventional layout, the prone pilot also had limited rear vision - which in mock combat scenarios proved to be a major drawback. Also it was unclear how the pilot could eject from such a position. The final nail in the coffin was the fact that pressurised g-suits were becoming better and better and they were a far simpler and effective solution. Amazingly the Gloster Meteor F8 Prone Pilot still survives, and is preserved at the Royal Air Force Museum Cosford.